Fall is officially here and pumpkins are springing up every where! There is a decidedly different feeling to the air in the morning even though the afternoons are still hot. Doesn’t it feel amazing? I like to leave up my fall decorations until Thanksgiving is over and just make a few subtle changes for Halloween and Thanksgiving. 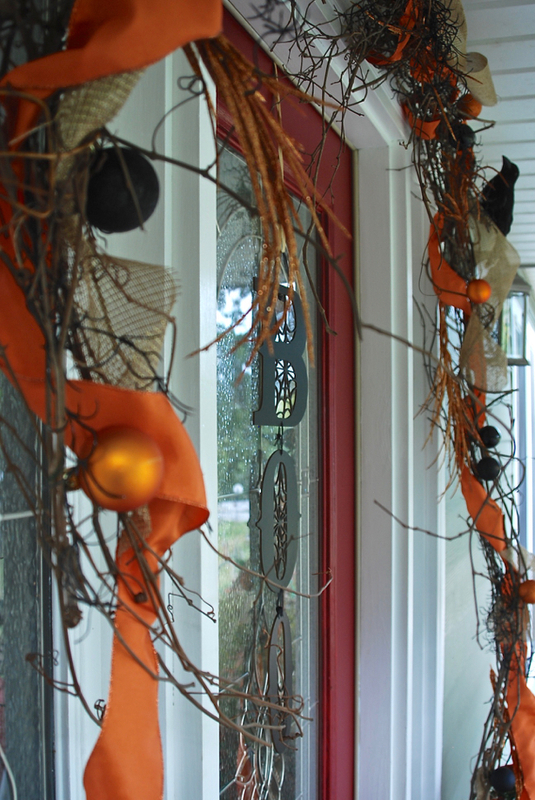 I go all out for fall decorating, and I love to stick with classic autumnal themes, so Halloween doesn’t get much attention, and whatever I do the transition from fall décor to Halloween needs to be cheap and easy. 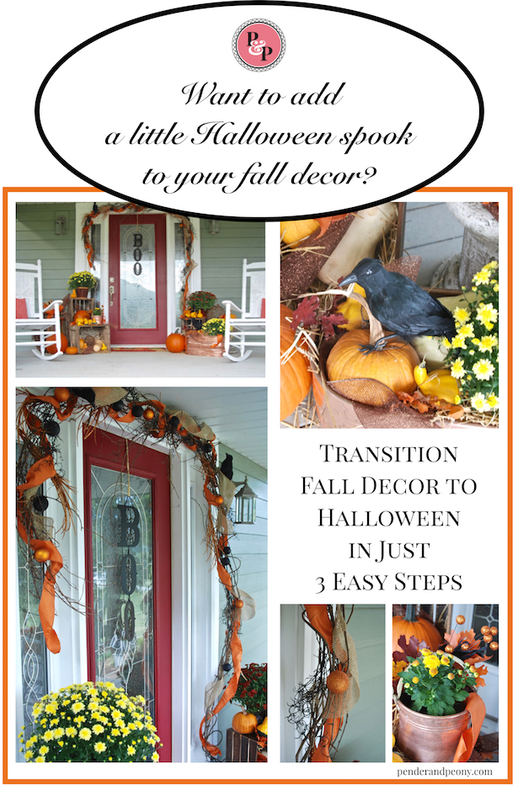 This year I thought I would add a little spook to my fall décor, and show you a few easy ideas to transition your fall décor to Halloween. 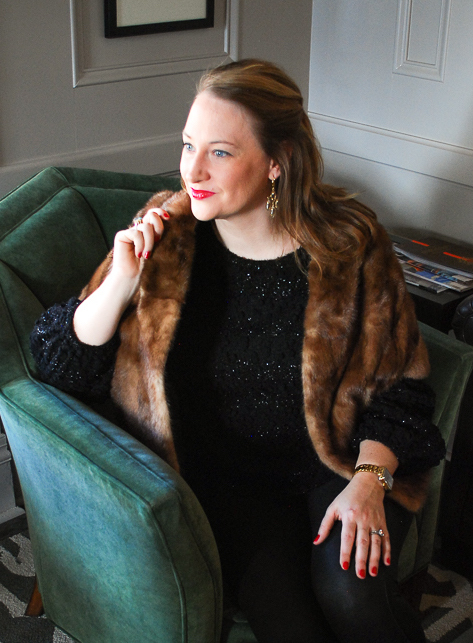 I did this same type of transition with my summer to fall mantle, and it worked so well. It’s my mother’s front porch all decked out for fall. 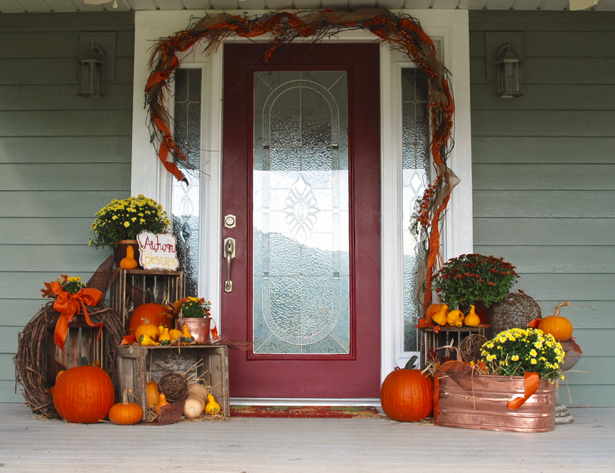 Even though she doesn’t get many trick-or-treaters, I wanted to show you how to take a classic fall porch from autumn to Halloween with just a few simple additions. 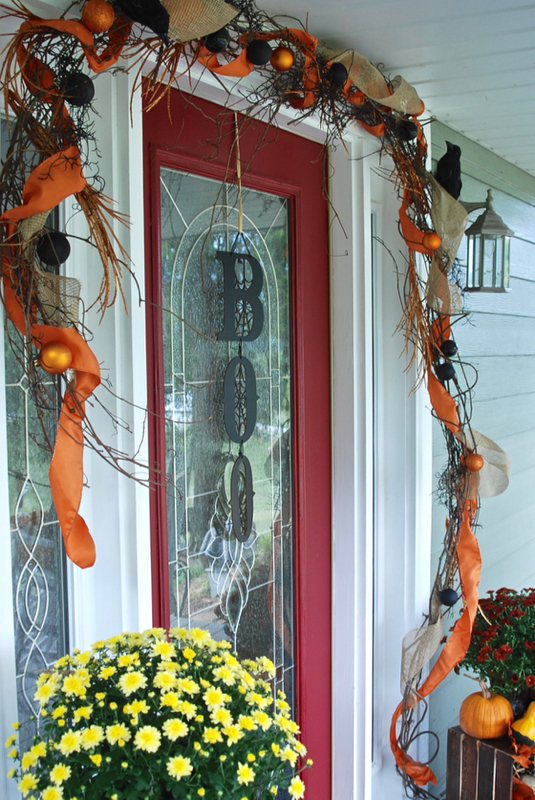 See all the fall porch photos here. This is such an easy transition because I already had the “building blocks” in place with the pumpkins, gourds, and mums. We left the crate vignettes on either side of the door as well as the grapevine garland and mainly just added to these elements. With a classic autumn color palette of orange, yellow, and red, all you need is some black to amp up the spook factor. 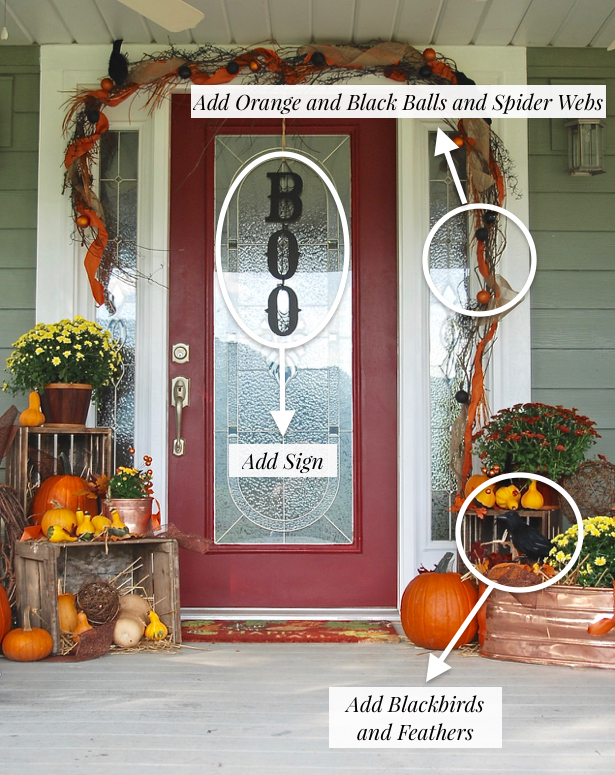 Spooky birds, pops of black, spider webs, and a fun sign take this fall porch from autumn to Halloween. The blackbirds, orange and black balls, and the sign all came from Michaels. They were inexpensive and involved very little effort to add. The sign is a light weight wood, so very easy to hang. 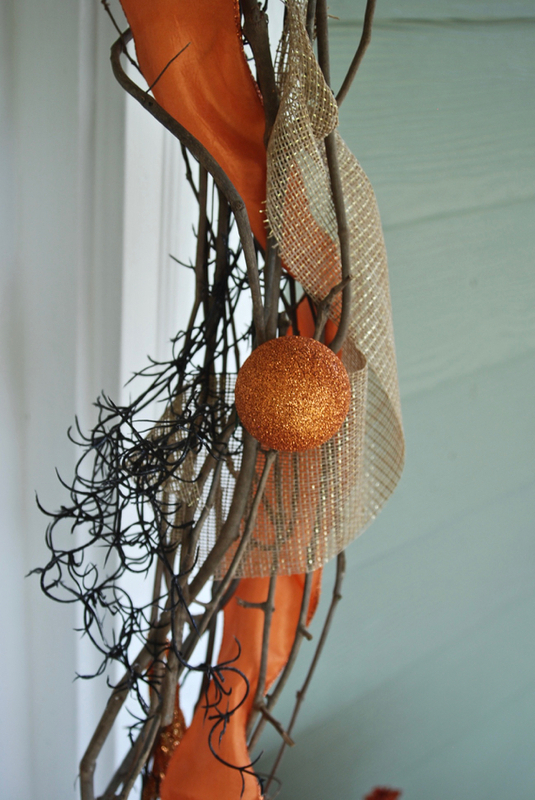 Re-vamp the grapevine garland – remove fall berry sprigs and add black spider web and orange and black balls. Scatter black birds on vignettes and garland and add feathers to mums. Hang Boo sign on door. 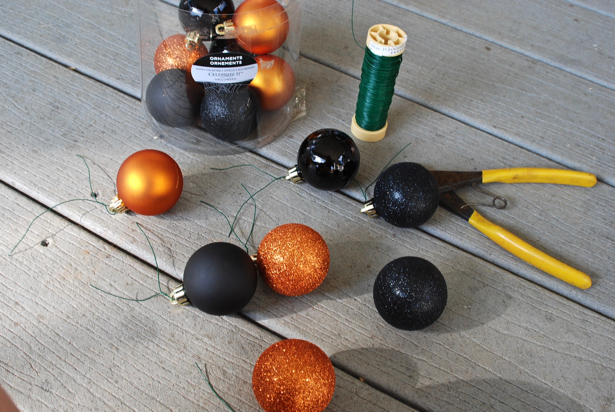 To fix the orange and black balls to the garland, gut green floral wire into approximately 4 inch lengths. Thread through holes and twist. Then strategically place all over garland, wrapping wire around grapevine branches to secure in place. There is a bit more Halloween spook on the front porch now! That was so easy, right? What are you doing to transition for Halloween? 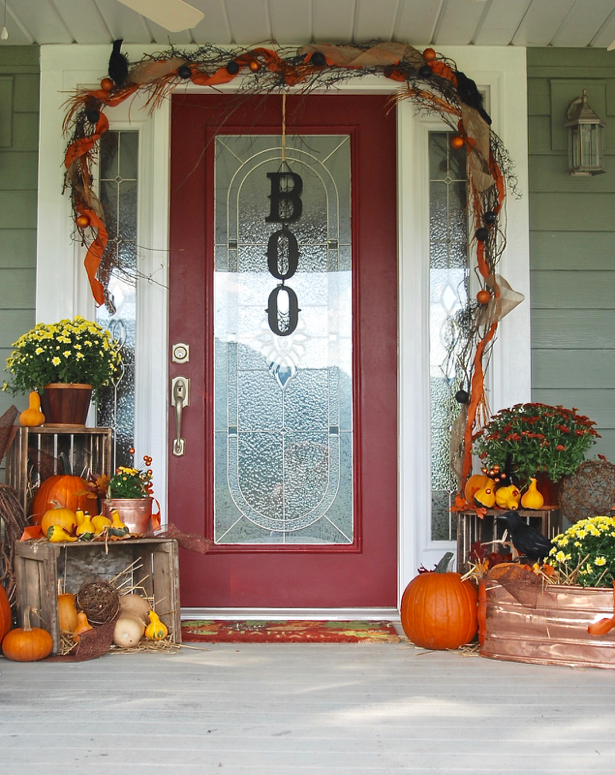 Want some more fall decorating ideas? Check out this fall vignette! 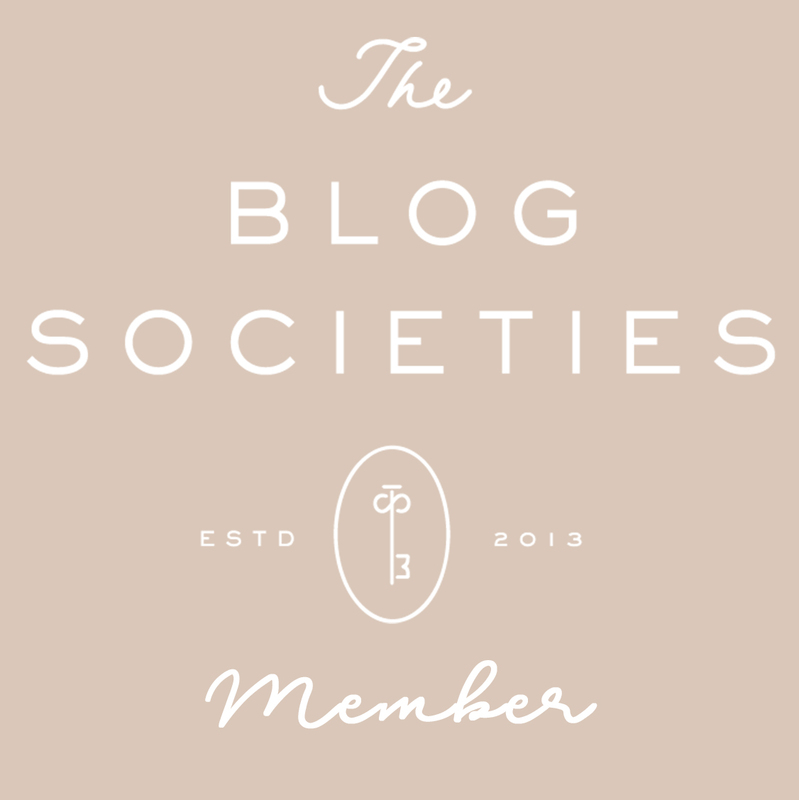 Plus I’ve got a great seasonal decorating guide for you when you join the P&P Social Circle. Sign me up and send me the guide! This is great! 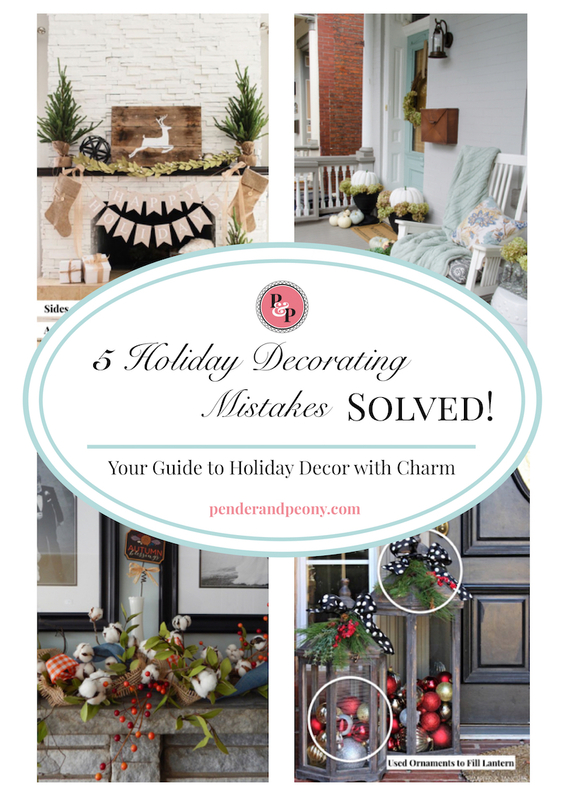 With a mom’s push for time between home and career, simple and easy “additions” help keep everything well presented, and provide beautiful decorations for all to enjoy! Dr. B. What a great idea! I hate putting up fall decor just to switch it out for Halloween decor for a couple of weeks. I like how you incorporate both! This is indeed spooky. It’s a creative way to celebrate Halloween this year. 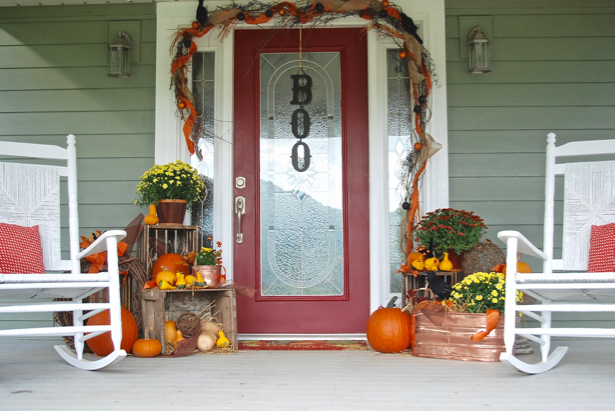 Your design will sure inspire a lot of people when it comes to decorating their own front porch also. The colors you chose are really for Halloween, colorful yet, there’s a ‘boo’ effect.